Do you have dry or oily skin? Do you suffer from acne and blemishes and blackheads? Are you interested in eliminating those skin problems, throwing away your expensive cleansers, many of which have harsh and unhealthy chemicals in them? Have you ever washed your face with oil? I know it sounds kind of weird, but, trust me. My skin has never been better. One basic rule of chemistry is that “like dissolves like.” Cleansing your face with oil breaks down and clears the toxins out of the sebaceous glands of your skin and helps your body produce the natural oils that it wants to in order for your skin to have the most natural and healthy glow…..these are the naturally producing oils in our body that harsh, store-bought cleansers remove. 1. Massage oil into your face and neck, using a gently upward motion, making sure to cover all areas. 2. Get the washcloth nice and hot in the water and lay it over your face to let the steam permeate your skin for 10-20 seconds. 3. Gently remove all of the oil from your face and neck with the washcloth. 4. Enjoy compliments and feeling great in your beautiful and glowing skin. I taught a Kitchen Cosmetics workshop over the weekend. The participants and I made and did a facial steam, a facial oil wash and massage, an exfoliation, a facial mask, a body scrub and a bath sachet. It was fun and silly and everyone left with beautiful and glowing skin. 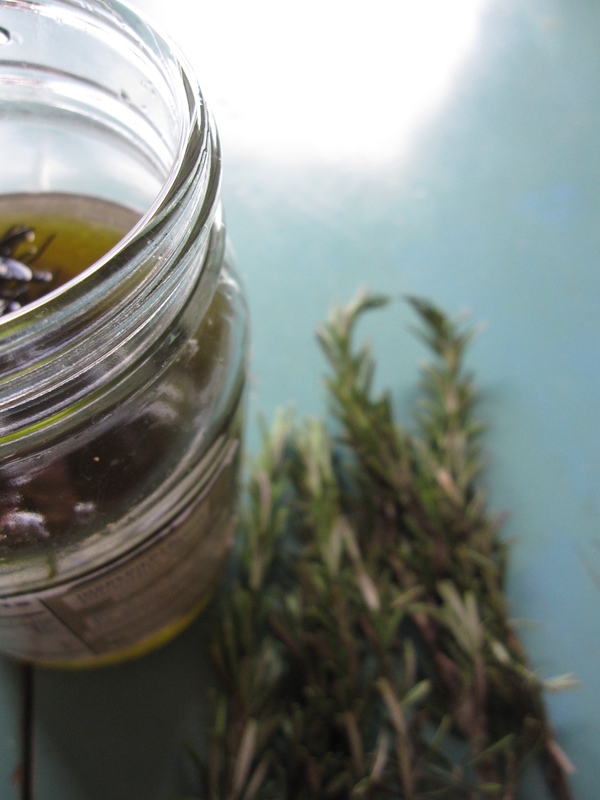 For the face and neck massage oil in the workshop I steeped rosemary in olive oil with 15-20 drops of rosemary essential oil somewhere dry and dark for two weeks. The workshop participants massaged and washed their faces with this mixture. They then each took a bottle home with them to use. 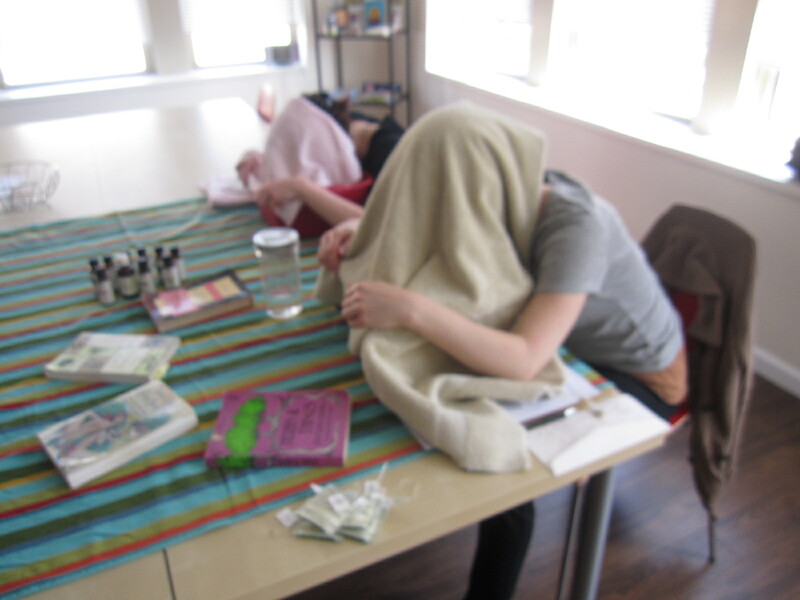 Debbie and Mia steaming their faces and necks with peppermint & thyme. Michele applying the sugar, olive oil & bergamot foot and body scrub. Feeling blue that you missed the workshop? There will be more Kitchen Cosmetics workshops in the future. Check out my blog and my website for more information. Are there any special home spa treatments you like to make whenever you feel like treating yourself? Let me know! I’m always interested in learning more. 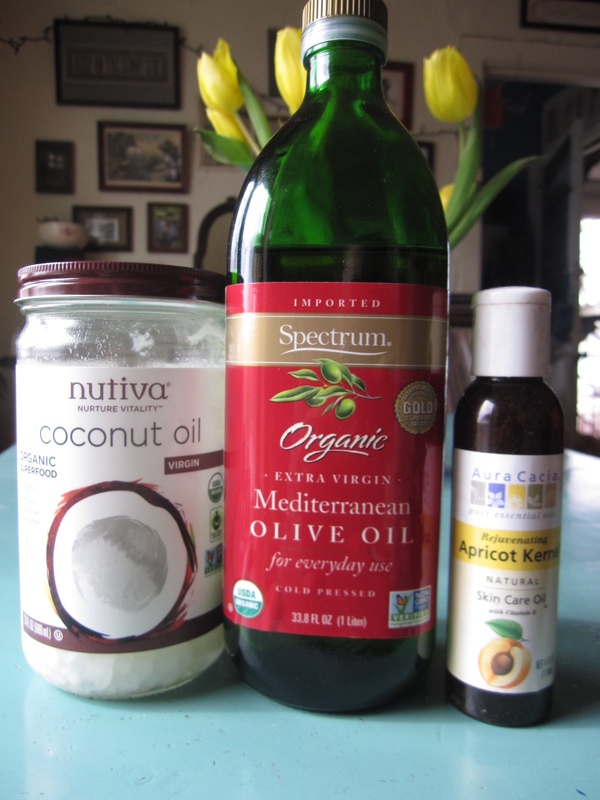 Did you know I also make my own massage cream? Only 2 organic and natural ingredients. Sign up for a massage today and not only get some well deserved self-care, but treat your skin to some extra love. That looks like it was an awesome workshop! You have so many great ideas. One home “spa treatment” that I like is not even something that needs to be mixed up at all. I rub honey all over my face, let it stay for about 15 minutes, then massage it in and rinse thoroughly. My skin feels smoother and looks brighter and refreshed. Thanks for sharing! I love that too! Had a great time at the workshop. Learned so much and am enjoying one of the homemade products (shea butter and almond oil body cream) as I type this. Thanks much for offering this Allison. Thank you so much for being a part of it, Michele! I’m glad you had a great time.